I finally got to take Merilee for a flight. She did great and actually said she could see herself getting used to it. Until now she had only flown on much larger aircraft. The take off and flight went well, nothing to report, but it was the landing that I was most concerned about. A good landing would instill the confidence in Merilee that would mean many more flights together. A bad landing could spell the end of our flying days. I should give her more credit than that though...she's very supportive. None-the-less, I was concerned with making it the best landing ever. 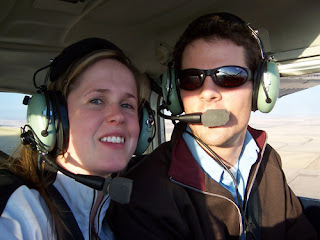 I even warned her that in these small planes, you feel every bump and shimmy as you touch down, and not to be worried. With that said I lined up on final approach and brought it in by the book. I suppose it's a good sign when your passengers aren't certian when it was you touched down and just realize they're on the ground! Well, it wasn't that good, but it was pretty close. She brings the best out of me I guess. Flying Into Calgary! Cue Dramatic Music.